In January, Google featured Zora Neale Hurston on its U.S. homepage, and the Internet loved it. What started with a Google Doodle quickly became the impetus for a wider celebration of Hurston’s life and work. People on my Tumblr dashboard were talking about the Doodle just minutes after it went up, while Facebook and Twitter provided dozens of links to articles about Hurston. The excitement was steady throughout the day, and even continued a couple days after the Doodle was taken down. In case you haven’t heard the term, Google Doodles are the drawings and animations that often replace the Google logo on holidays or birthdays of historical figures. Sometimes the Doodles are seen worldwide (called “Global Doodles”), but mostly they’re reserved for the country in which the holiday or individual is best known, as was the case with Hurston—her Doodle was only visible on Google’s U.S. homepage. Google Doodles honor people that have made significant contributions to the world in their lifetimes. Like postage stamps, you can only be honored with a Doodle posthumously. The very first Doodle to celebrate an individual appeared in 2001 in honor of Monet, but the Doodles didn’t start making frequent appearances on Google’s homepage until around 2010. Few of them get as much attention as Hurston’s. So what was special about this one? Here’s a theory: maybe it was special because it’s one of the few times that the Internet saw Google honor a black woman on its front page. Maybe it was special because it’s uncommon for Google to celebrate historical women of color. For a while now, we at SPARK have noticed that white men get featured on the Google homepage all the time, whereas women of color are rarely honored. But it wasn’t until September 2013 that we set out to find the exact numbers. We started researching, pouring through hundreds of Google Doodles for months. And it turns out that from 2010-2013, Google celebrated 445 individuals on its various homepages throughout the world. 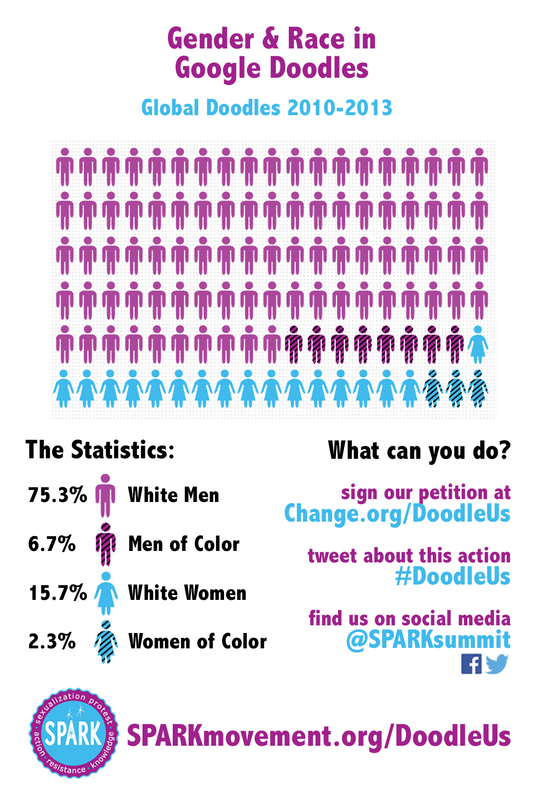 19 were women of color, 54 were white women, 82 were men of color, and an overwhelming 275 were white men. About half of those 19 women of color appeared in 2013 alone, so at least we can say there’s been some progress. There were 24 Global Doodles (Doodles visible on every Google homepage around the world) that same year, two of which featured black women. This makes 2013 the first year that celebrated a woman of color with a Global Doodle, which is basically the highest honor that Google gives to historical figures. And yes, it really took until 2013. But despite this great moment in Google Doodle history, there hasn’t been a single Asian, Latina, or indigenous woman featured in a Global Doodle as of February 2014. If I’d heard about this a few years ago, I would’ve dismissed everything with a shrug and made excuses for Google. I used to think that up until a few decades ago, everyone except rich white men were too oppressed to achieve anything significant. And I’m definitely not the only one who’s thought this way! But it’s actually ridiculous and a complete lie that white men have done everything. How can that be, when they’re a minority in the world? Not to mention that black and brown people didn’t just sit around for thousands of years and wait for the white people to “discover” them, despite what history textbooks imply. Now that the SPARK team has (almost) recovered from being totally mind-blown by the statistics we’ve uncovered, we’re demanding that Google make a concerted effort to change such a blatant imbalance. We want them to acknowledge the problem, but we also want more: we want Google to publicly commit to improving these numbers. We’d be happy to help out—in fact, we’ve already gotten a head start by compiling a list of historical heroes that totally deserve Doodles, and that way Google has to do less research. As mentioned, the Doodles have made progress in 2013, something that has continued in 2014. About half the Doodles in January were dedicated to women—a few people that we had on our list of awesome historical heroes even got Doodled. And by celebrating five women of color in the first two months of this year, there have already been more women of color in 2014 than there were in 2010, 2011, and 2012. This is probably thanks in part to people like Ann M. Martin, a science educator who has been tracking gender in Google Doodles dating back to 2001. But small changes are not enough. We need to talk about why the numbers have been skewed for so long, and what it says about how we view history—whose achievements are important, whose achievements we celebrate, and whose achievements are erased. Google Doodles may seem lighthearted, especially when accompanied by quirky games and animation, but in reality they have emerged as a new manifestation of who we value as a society, a sign of who “matters.” Just like statues, stamps, and national holidays, you know that if someone is featured on Google’s homepage, they’ve done something important. We’re asking Google to make improvements, but this project is bigger than Google Doodles. It’s is about becoming visible in a society that erases our history and our existence; it’s about acknowledging and celebrating our part in building this world. So we’re asking Google to Doodle Us. Not the SPARK team specifically, but people like us: women, people of color, people with disabilities, queer people, trans people. We’re asking Google to draw our histories, our achievements, our strength, our heroes, our fighters and foremothers. You can’t keep ignoring us. We’re here, and we’ve always been here. We’re in contact with Ann Martin about her incredible work right now, but this is a project we approached independently. We didn’t steal any graphics–everything we’re using and releasing in conjunction with this action was created by members of the SPARKteam. We also didn’t intentionally lift any phrasing, but because our work on this action is similar to her work, there are probably similarities in the phrasing we use. If you have specific examples where our phrasing is the same, please let us know so we can make those changes. I find it hard to believe they are independent. They are independent of one another, completely. 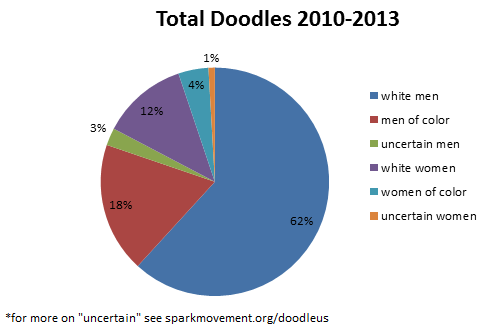 Our graphic is charting race and gender in Global Doodles between 2010 and 2013, and Ann Martin’s graphic that you linked to is charting only gender across all Doodles in 2013 alone. The data is completely separate, and using outlines of humans to represent people in infographics is a practice that stretches far beyond us or Ann Martin. Also, any research into the topic would have turned up the work at speakingupforus.wordpress.com and a reference/link/citation would have been in order. Let’s not step on each other when we all want the same thing! Perhaps before arguing with me, you should check into whether your team read her work. I would bet the answer is yes. A lesson in professionalism and scholarly citations is probably needed. I find it strange that the work of Ann Martin on http://speakingupforus.wordpress.com/, as mentioned above, is not talked about ANYWHERE in SPARK’s pages. That work has been going on for a few years now, and those of us who are aware of it, including your own researchers, no doubt, are fairly confident that her work is largely responsible for, as you put it on this page, the fact that “Doodles have made progress in 2013, something that has continued in 2014.” Imagine working on something for that long, finally seeing results, only to have a larger group swoop in and take credit for the change once it’s happened. This is extremely disappointing, and not a good way for young people striving to change the world to start off their careers. So when I saw the link to this come up in my twitter feed this morning I thought “Great! Ann’s work is finally getting the recognition it deserves!” The I came here and saw no mention of her and was really confused. Let’s be clear about this: Ann Martin hasn’t only been compiling statistics (although that’s something she’s discussed at length). Through her blog at http://speakingupforus.wordpress.com/ she’s been promoting women’s history by discussing a prominent woman that google could have featured instead. If you google “women in google doodles” Ann’s website is on the first page of results. I find it unbelievable that you would not have come across Ann’s work while doing research for this project. If you want to help the cause, please give credit where its due! And now one sees multiple reporting on the work you claim only as yours from sites like WSJ and Jezebel, without any mention of the original work done by Ann, let alone giving her due credit for being the back on which your entire project is built. Does that seem right to you? Wholeheartedly agree with Sabrina and Vicky – Ann Martin has been compiling and blogging about this stuff for years. Either your research team failed to do their research, or they blatantly lifted her work and published it as your own. Please give credit where it’s due and support Ann’s incredibly hard work. The Google Doodles just point out that most of the technological and scientific discoveries/contributions in the past few hundred years have in fact been by white men. Now wait. This doesn’t mean women aren’t capable of producing such accomplishments; most of this is due to the structure of past society (e.g. only men receiving education and being encouraged to make said discoveries). 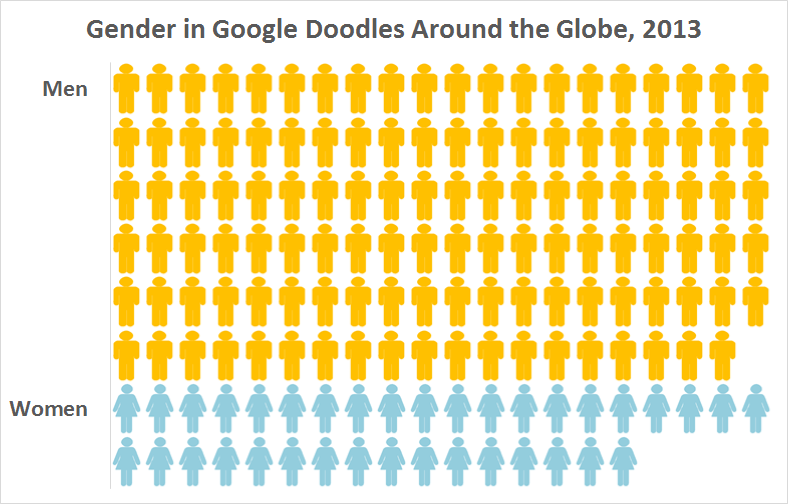 Things have changed, and with women making more contributions than ever before (and graduating at higher rates than men) I’d imagine in 100 years, Google Doogles would have a very different makeup. However, you can’t fault Google for representing our history, which, by and large, has been dominated by white men. Again, that has changed, and is changing. However, you can’t say that Google hasn’t been accurate. Should Google choose people with less accomplishments for the sake of diversity? I think you should take a look at the work that Ann Martin has done before claiming that Google is merely celebrating people with the greater accomplishments – some of the choices that Google has made have been downright bizarre when comparing to the accomplishments of a woman who could have been celebrated on the same day. See http://speakingupforus.wordpress.com/ for more. I’m sympathetic to causes like this, but as far as I can tell, Google does celebrate both women and people of colour in its Doodles. It’s an unfortunate fact that in the history of western civilisation (and, let’s face it, there’s going to be a natural cultural bias against the great Arab and Chinese scientists, astronomers, physicians and philosophers of the past), most people of note were white men. To be sure, this was at least partially due to privilege, but it’s still a fact. What is Google to do? Discriminate against white men to retroactively rebalance? Think of all the interesting, important and worthy characters who would have to miss out. I believe that, given there is still plenty of Doodle coverage of people of colour, women and other non-white, non-male groups (and while the selections are interesting and sometimes unusual), energies could be better spent dealing with real discrimination and real issues that actually affect people. Maybe I’ve missed something — so I’m happy to hear why my view is egregious, but that’s where I stand for now. As I’ve said in a reply above, I think you should take a look at the work that Ann Martin has done before claiming that Google is merely celebrating people with the greater accomplishments – some of the choices that Google has made have been downright bizarre when comparing to the accomplishments of a woman who could have been celebrated on the same day. See http://speakingupforus.wordpress.com/ for more. But Carolyn, neither I nor ‘S’ were arguing that Google is merely celebrating people with ‘greater accomplishments’. What I was saying is that Google represents people of colour and women in its Doodles, but the number is smaller than the white male Doodles because the number of white males with noteworthy accomplishments is greater than the number of people of colour and women with noteworthy achievements. I concede that that might be because of previous privilege or oppression. But either way, it is a fact. Therefore, it is natural that all other things being equal (including the “greatness” of the achievement, whatever that might mean), Google has more achievements from white men than from people of colour or women. As ‘S’ said, if Doodles are still here in a hundred years, there’s no doubt that its makeup will be very different. Maybe somebody associated Sparks will even be celebrated for making a difference. I hope so — but it won’t happen unless you attack issues that actually matter, as opposed to ones like this. Indeed. Schrödinger, Debussy, Rorschach, Kafka, Gaudi, Petri, Euler, Douglas Adams, Copernicus, etc are complete strangers in Western culture. As other commentators have pointed out, this blog has some strong resemblances to another female scientist and science educator’s blog, http://speakingupforus.wordpress.com/ by Ann Martin. The editor’s note is a good start to addressing what I hope was oversight. In the future, it would benefit everyone if bloggers and all communicators made sure to give credit where it is due. Many voices with similar messages strengthen a cause, and crediting others appropriately leads to wider recognition of both voices and opens doors to beneficial collaborations. Supporting everyone’s voices is a vital component of successful and authentic activism of the type Spark aspires to. We really appreciate these comments, and we’re excited to say that we’ll be working closely with Ann Martin going forward on this action. It was an oversight on our part that her work wasn’t shouted out to, and we’re thrilled now to be able to correct that and help elevate her blog and research. We have exciting ideas about ways to collaborate that we can’t wait to get to work on and share with everyone. After all, this entire action is about women becoming more prominent and recognized for the work that they do! I’m glad to hear that SPARK is working to right this wrong – and I look forward to seeing what you come up with! Excellent to hear – I’m very much looking forward to hearing more about your collaboration! I have a lot of respect for what you’re trying to accomplish, but men have historically made more important contributions. That’s changing now (and that’s a good thing), but do you propose that Google artificially balance the ratio of men and women in their doodles, instead of featuring people who are truly deserving?